During the official visit of the United Arab Emirates Government delegation to Montenegro, Sultan Bin Saeed Al Mansoori, the Minister of Economy of the UAE, together with Miomir Mugoša, Mayor of Podgorica and Duško Knežević, President of the Atlas Group, officially opened a street named after the founder of the UAE Sheikh Zayed on 12 June 2013. The official opening of the Sheikh Zayed Street, which connects the Cetinje road and the George Washington Boulevard, announced the completion of the work on the Atlas Capital Centre and its official opening in autumn of this year. Sheikh Zayed bin Sultan Al Nahyan, in whose honour the street was named, was the founder of the United Arab Emirates. The street named after Sheikh Zayed is a confirmation of the friendship between the United Arab Emirates and Montenegro, which was established back in the seventies with the erstwhile Yugoslavia. "Montenegro and the United Arab Emirates understand each other well when it comes to economic and social progress and the overall emancipation of our peoples and countries. It is our common goal to improve economic cooperation between our two friendly countries, and that investors from the UAE find interest for investing in development projects in Montenegro and its Capital City”, said the Mayor of Podgorica, Miomir Mugoša. One of the companies who found an interest to invest in Montenegro is Abu Dhabi Capital Investment, which is near the completion of works on the Atlas Capital Centre together with the Atlas Group. The official opening of one of the biggest property development projects in Montenegro, but also in the region, is scheduled for autumn of this year. This development will soon house the diplomatic representations of a number of countries and business representations of the most renowned companies and brands in the world. "At this moment when we still feel the harsh consequences of the crisis, we can announce the completion of the work and the official opening in autumn of this year, despite the inevitable deadline delays. For this reason, when we stand in front of this landscape changing building, a building which sets new standards for construction, energy efficiency and ecological construction, we who have built it, but also our citizens, have every reason to be very proud today“, said Atlas Group President Dr Duško Knežević. The 100.000 m2 Atlas Capital Centre contains residential and commercial units, and the value of the project amounts to €140 million. The partnership for the construction of the Atlas Capital Centre set the foundations for even better economic cooperation between Montenegro and the UAE. "The relationship between our two countries is continuing to develop. This is just one investment. There are many other ongoing investments, especially in the fields of tourism, agriculture and the field of medium enterprises which we are currently researching together with your Government“, said the Minister of Economy of the UAE, Sultan Bin Saeed Al Mansoori. The opening of the Sheikh Zayed Street was also attended by H.E. Mrs Hafsa Al Ulama, the UAE Ambassador to Montenegro, H.E. Mr Aleksandar Eraković, the Montenegrin Ambassador to the UAE, and Abubaker Al Khouri, Director of Sorouh Real Estate. Good relations between the two countries are also reflected in the announcement of the establishment of an airline between Montenegro and the United Arab Emirates on which the airline companies of the two countries are currently working on. In addition to the delegation of the UAE Government, the opening ceremony of the street named after the founder of the UAE Sheikh Zayed was attended by representatives of the Atlas Group, Capital City, the architectural studio and the companies which participated in the implementation of the project. After the official opening of the street, the UAE delegation, together with the President of the Atlas Group, Mayor Mugoša and H.E. Mrs Hafsa Al Ulama, Ambassador of the United Arab Emirates, visited the finishing works on the Atlas Capital Centre, a joint investment by the Atlas Group and Abu Dhabi Capital Group. The Minister of Economy Sultan Bin Saeed Al Mansoori led the delegation of the Government of the United Arab Emirates which visited Montenegro from June 12-14. During the visit, they had a series of meetings at the highest level with representatives of the Government of Montenegro, local government and the business sector. Atlas Capital Center is the first large, €140 million worth joint investment between Montenegro and the United Arab Emirates companies - Atlas Group and Abu Dhabi Capital Group. Atlas Capital Center is located in the business and administrative part of Podgorica, capital of Montenegro. On an area of about 90,000 m2, of which 26,000 m2 of living and commercial space and 40,000 m2 of office space, Atlas Capital Centre stands out for its innovative standards of building, high energy efficiency and most modern communication system. During the offcial visit to Montenegro of the delegation of the Government of the United Arab Emirates, Sultan Bin Saeed Al Mansoori, the Minister of Economy of the UAE, together with Miomir Mugoša, Mayor of Podgorica and Duško Kneževic, President of the Atlas Group, officially opened a street named after the founder of the UAE Sheikh Zayed on June 12, 2013. The Chamber of Commerce of Belgrade tonight presented the annual ’Beogradski pobednik’ awards at the National Theatre, and the honour of receiving these awards went to those whose work allowed them to achieve extraordinary results in economic activities, development and progress of our economy, and the title of most successful businessman of 2012 went to Miroljub Aleksić, founder and owner of the company ‘Alco Group’. 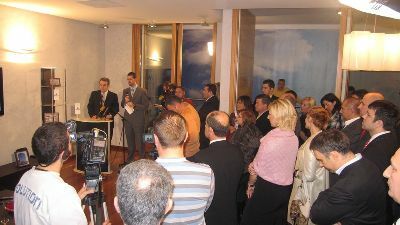 The audience first heard an address by the President of the Chamber of Commerce of Belgrade, Milan Janković. - Tonight we have with us winners in the public, social and political fields. People who created innovations, who paved the way where there was the most competition – said Mr. Janković and added that this is a crucial year for our country but that Serbia is a winner and that the people should feel so too. The annual Chamber of Commerce of Belgrade Award and Lifetime Achievement Award went to Miodrag Babić, founder and owner of the company ‘BNM International’ for developing and improving the fields he worked in. - After graduating at the Faculty of Technology in Belgrade, I went to Vršac where I got employed in ‘Hemofarm’ a company I did not know a lot about at the time. It was then that I realized that I can be successful– said Mr. Babić. Among the awarded companies are also ‘Maja promet’, ‘Zoo vrt grada Beograda’, ‘Auto Čačak’, Public Utilities Company ‘Pogrebne usluge’, ‘Alma Quattro’, ‘Food land’, ‘Procredit banka’, ‘Asseco see’, ‘Delta generali osiguranje’ and Public Company ‘Elektromreža Srbije’. The annual ‘Plaketa’ award of the Chamber of Commerce of Belgrade was presented to the ‘Konrad Adenauer’ Foundation in Serbia and to the team of the Faculty of Law in Belgrade for contributing and improving business in the field they work in. The award for extraordinary merits for development, improvement and international cooperation was presented to Mr. Duško Knežević, founder and president of ‘Atlas Group’. - My destiny is linked to Belgrade. 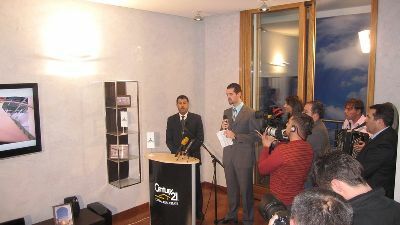 I was educated and later began my business career here – said Mr. Knežević when he received the award. He added that he hoped that Belgrade will again become the centre of South-East Europe. The ‘Businessman of the Year’ Award was presented to Mr. Miroljub Aleksić, founder and owner of the company ’Alco Group’, for achieved business results in 2012,. - I hope that state officials will implement necessary reforms in the next period to stop our country from getting into a difficult situation other countries, like Italy and Greece, found themselves in due to the economic crisis. If these reforms are implemented, investors will want to invest in Serbia – said Mr. Aleksić, who thanked his family, but also the employed in his company for the hard work they have done to achieve significant results. 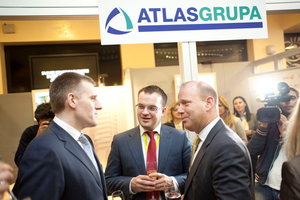 Again this year Atlas Group is the General Sponsor of Festival of real estate and Investments FREI 2013 in Budva, Miločer, Montenegro, Hotel "Maestral", 22 – 25. April 2013. Festival of Real Estate Investment – FREI is a themed and selective event dedicated to the topics of investing and real estate sector development. The gathering is intended for the investors and commercial companies in the field of real estate, representatives of state bodies, infrastructure companies, representatives of international institutions, professional and general public. FREI represents a modern form of exchange of information and experiences, as well as acquiring new knowledge, with the aim of strengthening the bases for a more efficient operation of the entities interested in the real estate investment sector. Festival is organized under the auspices of Prime Minister of Montenegro. Programme bearer is Ministry of tourism and sustainable development, as a State body in charge of FREI themes. FREI comprises of many programme forms, some of them being FREI exhibition and renowned FREI programmes such as „Success Stories“, FREI-focus, FREI tribune, FREI parliament. - Atlas Invest, a company that prepares, creates and manages construction of all projects in Atlas Group portfolio and offers services of complete legal, financial and technical engineering, in the aim of secure, quality and fast investment realization. - Capital Real Estate, the first Century 21 agency in Montenegro that operates in franchise system Century 21. This agency, among other tasks, is entrusted with sale and rent of the biggest object in Montenegro and the region, Atlas Capital Center. - Atlas Capital Center, joint venture of Atlas Group and company Capital Investment from UAE, the biggest building ever built in Montenegro with 93000m2, the largest international investment in the field of real estate in Montenegro so far, and the largest project in the region realized in the times of global economic crisis. 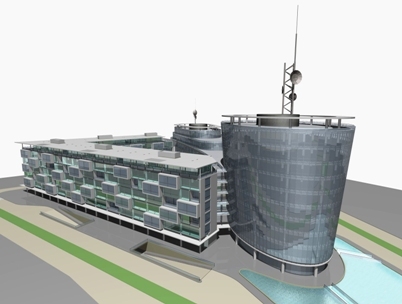 Atlas Capital Center is a model of future construction, technically the most advanced facility in Montenegro, and wider. - New Fair complex that Atlas Group is realizing with partners from London. On the second day of the festival, 24.04.2013. at 12:40h, in plenary session ‘’Success stories’’ Atlas Group will present their project in Budva ‘’Mogren Town’’. The new design concept will be discussed by one of the authors, the architect Jugoslav Janjić, architectural studio Design Architecture from Belgrade. Dr Dusko Knezevic was guest of President Clinton to to the event on the University in Nicosia on Saturday the 21st of July where Clinton, as Laureate’s Honorary Chancellor, delivered message focused on linkage between higher education and economic development to this Laureate International Universities member institution in Cyprus. During the meeting the former US president Bill Clinton and President of Atlas Group Duško Knežević expressed their satisfaction with previous cooperation and projects of the Atlas Group and the Atlas Foundation as the members of Clinton Global Initiative. Knežević and Clinton spoke about future cooperation in areas of education, green economy and socially responsible behavior. At the University in Nicosia, Knežević also had a meeting with the management of the European University Cyprus: president dr Andreas Elefteriades and rector Andreas Orfanides with whom he spoke about cooperation with the Mediterranean University and forming of mutual programs from European studies. On Sunday 21 July, President of Atlas Group, dr Duško Knežević will participate at the European University Cyprus in Nicosia at the meeting entitled “The Current Global Economic Situation” invited by the founder of the Clinton Foundation and 42nd President of United States, Bill Clinton. Cyprus, which is holding the EU Presidency, will host a meeting that will gather Cypriot highest officials. This meeting will be focused on the significance of joint, inter-state and cross-sector participation in facing challenges of today’s economy. 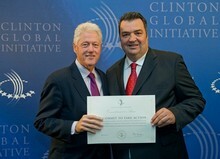 This fundamental concept of Clinton Global Initiative was also promoted in Montenegro in May last year when, invited by Knežević as CGI member, Clinton visited Montenegro and participated at the Inaugural Conference “Balkan Networking for Social Empowerment of South-Eastern Europe”, organised by the Government of Montenegro and Atlas Foundation. Panel Discussion "Balkan Networking Youth Networking"
Atlas Foundation and IG Alpbach Podgorica (member of the European Forum Alpbach Network) organised a panel discussion “Balkan Networking – Youth Networking“ on Saturday 9 June starting at12:00pm at the Atlas Foundation Hall,4 Stanka Dragojevića Street. At the opening,guests were greeted via video message by Mr Franz Fischler, PhD, President of the European Forum Alpbach. He pointed out that connecting young people is crucial for uniting European countries, and that this conference is of paramount importance for integration of the region. Rector of the Mediterranean University, Prof Slobodan Backović, PhD, said that the aim of this project is to show to the young that they are the ones who can easily overcome all the issues from the past and accelerate the path towards EU for the countries from the region. Austrian ambassador in Montenegro, Mr Martin Pammeralso addressed the audience, emphasizing the significance of young people’s belief in the future of their country. He advised them to travel more, to learn foreign languages and to be tolerant and open. Panellists of the first part of the programme were the following: Mr Philippe Narval, Managing Director of the European Forum Alpbach and members of regional Initiative Groups of European Forum Alpbach, as well as a representative of NGO European Alternatives from UK. During the second part of the programme, students had the opportunity to talk with distinguished young Montengrin leaders, active and reputable in different fields: Olivera Komar, PhD, Vladimir Vučinić, Bosiljka Vuković, Gojko Maksimović, Nikola Vukčević, PhD, Ana NivesRadović and DaliborkaUljarević. This panel was aimed at drawing attention of young Montenegrins to the essence of networking, especially regional cooperation and its positive impact on their careers. The goal is to stress out that networking is crucial for individual and professional development of each individual. Discussion focused on emphasizingthe importance of students’communication and cooperation with their peers from the region, given that young people can easily overcome the differences, reject burden of the past and foster economic and democratic reforms in the countries of South East Europe. Target group of this event were Montenegrin students from Mediterranean University, University of Montenegro and University Donja Gorica, as well as Atlas scholars. On 19 May, the President of Montenegro, Mr. Filip Vujanović, received in Tivat the delegation of the Managing Board of the SUMMIT100 business leaders of South-East Europe and supported further business integration of the region which ultimate goal is the creation of better economic and living conditions in this part of the world. 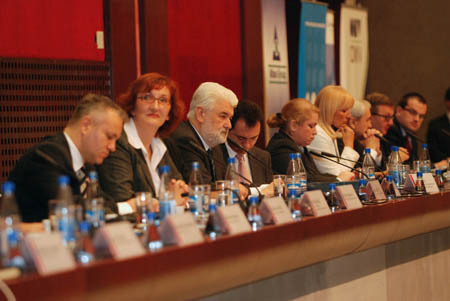 The meeting was held at the initiative of organizers of the SUMMIT100, the Serbian Association of Managers, the Croatian Employers` Association and the Managers` Association of Slovenia, and this to continue the dialogue between business and political leaders of the region initiated at the SUMMIT100 of business leaders held in Aranđelovac in October 2011. The SUMMIT100 delegation comprised of Mr. Branko Radujko, Telekom Srbija, the General manager and Chairman of the MB SUMMIT100; Mr. Duško Knežević, the President of Atlas Group and the Montenegrin representative in the SUMMIT100; Mr. Branislav Grujić, PSP Farman, President; Ms. Maja Piščević, the Serbian Association of Managers, Chairman of MB and Executive Director; Mr. Franjo Bobinac, Gorenje, General Manager; Mr. Iztok Seljak, Hidria, President of the Managing Board; Sonja Šmuc, the Managers` Association of Slovenia, Executive Director; Mr. Drago Podobnik, HIT, Chairman of the Managing Board; Mr. Damir Kuštrak, Agrokor, Executive Vice-president; Mr. Davor Davor Majetić, Executive Director, the Croatian Employers` Association; as well as Mr. Miša Lukić, Leo Burnett, Director and Creative Director of the SUMMIT100 and Ms. Jelena Radulović, Alba Partners, partner and program director of the SUMMIT100. The President Vujanović expressed his unreserved support to the initiative of further business integration, as well as to all cooperation projects of companies from this region that will contribute to a more competitive region, better offer of products and services to clients, but also to a more successful appearance on third markets. Mr. Oliver Corlette, the Managing Director of Porto Montenegro, and the mayors of municipalities from the Bay of Kotor and the Royal Capital Cetinje also joined the meeting later on. After the meeting, the President Vujanović and the delegation of the Managing Board of the SUMMIT100 business leaders of South-East Europe enjoyed a cocktail and they were joined by representatives of local governments from the Bay of Kotor and the corporate sector of Montenegro. Participants of the meeting addressed the media and the cocktail guests. The President of Montenegro, Mr. Filip Vujanović, the President of Atlas Group, Mr. Duško Knežević, and the Executive Director of the Managing Board of the SUMMIT100, Ms. Maja Piščević sent a joint message that Montenegro will also host one of the future SUMMIT100 meetings, and Montenegrin construction companies will become a part of Feniks Consortium which brings together constructors from the former Yugoslavia. Mr. Olivier Corlette, the Managing Director of Porto Montenegro also joined the messages communicated by the participants and, as a representative of one of the successful foreign investments in Montenegro, gave his support and highlighted benefits from investing in Montenegro. The mayor of Cetinje announced Greenfield and Brownfield stimulating packages to support investments in the Royal Capital. Festival is organized with programme support from Prime Minister of Montenegro Mr. Igor Lukšić, and at official opening speeches were given by Minister of Sustainable Development and Tourism Predrag Sekulić, Minister of Economy Vladimir Kavarić, Ma Vladimir Čvorović Atlas Group representative and Tim Levy Chairman of Future Capital Partners from London. FREI is a theme manifestation, aimed at development of Real Estate investments in Montenegro and the region. The idea of organizing Festival of real estate and investments - FREI was conceived in 2009, in the context of efforts in Montenegro to keep and promote position of attractive investment destination and to enable professional, structured and experienced contribution to development of real estate sector in the region. In previous years this Festival was attended by almost all significant Investors present in Montenegro, designer and construction companies, international experts, representatives of regional countries state bodies and large amount of business entities interested in this field. 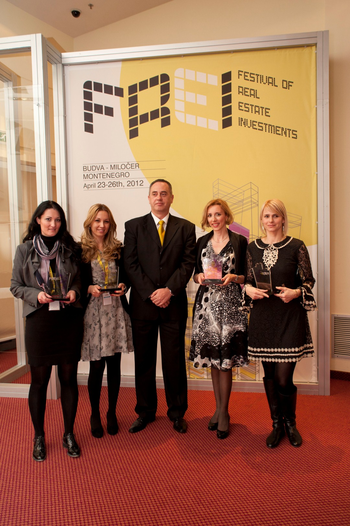 Main prize for best company presentation at third Festival of Real Estate and investments FREI 2012. was awarded to Atlas Group. Prize for best development presentation FREI 2012, was awarded to company “Studio Synthesis”, from Podgorica – for urban -Architectural design of city square “Pine” in Tivat, done by Waterfront concept. Prize for best exhibition stand was awarded to company „Zetagradnja”, while „Energoprojekt” from Belgrade was awarded for extreme quality and content of company presentation. Special award for extreme contribution to festival programme quality, professional approach and expertise shown went to company „Horwath HTL”. 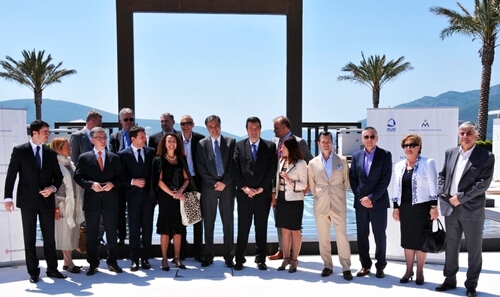 Atlas Group is General Sponsor of third Festival of real estate and investments FREI 2012 taking place in Budva, Miločer, Montenegro, Hotel „Maestral“, 23 – 26. April 2012. Festival aims at bringing together and information exchange between regional State bodies, Investors and commercial companies in the field of real estate, representatives of international institutions and professional public. FREI 2012 consists of multiple programme activities: FREI exhibition, „Successful Show“, FREI focus, FREI Forum, FREI parliament and other. - Atlas Invest Ltd. is a company that prepares, creates and monitors construction of all projects within Atlas Group portfolio and provides complete services of legal, financial and technical engineering support, in the aim of secure, quality and fast investment realization. - Century 21 Capital Real Estate is the first Century 21 agency in Montenegro and operates in franchise system of Century 21. This agency is entrusted with sale and rent of biggest object in Montenegro and region, Atlas Capital Center. - Atlas Capital Center, joint investment of Atlas Group and company Capital Investment from UAE, with 93000m2 is the biggest building in Montenegro ever built, the most expensive real estate international investment in Montenegro so far, and the largest development in region realized in the period of world economic crisis. Atlas Capital Centre is a model of future construction, technically the most advanced object in Montenegro, and wider region. - New Expo complex that Atlas Group is realizing with partners from London, Future Capital Partners. This company is one of leading UK alternative investment companies, specialized in investments in sustainable energy sources, real estate, health, financial services, media and entertainment. Within New Expo complex this company plans construction of 5* hotel and bringing well known global hotel operator. Vision of Atlas Group development is to realize all key projects in Montenegro and abroad with our foreign partners, who bring their specific knowledge, advanced technologies and management systems, apart from their equity. 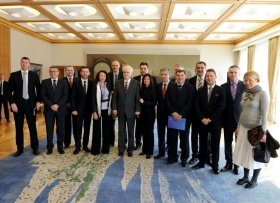 President of Croatia Ivo Josipović had a meeting with the delegation of Board of Directors of Summit100 business leaders on 21 March 2012 in Zagreb. Summit100 is a forum of most prominent business leaders from the region, aimed at creating favourable business environment in the region, improvement of trade exchange and joint participation on third markets. 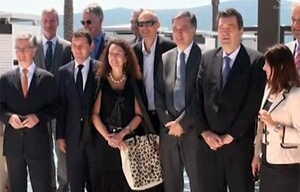 President of Atlas Group Duško Knežević, PhD, participated at the meeting as the only representative from Montenegro. Knežević advocated for greater cooperation of companies from the region and asked the Croatian president for larger support of politicians: "Politicians have to remove firstly political barriers, and then economic barriers, which also we that represent the business society have to overcome in order to achieve better cooperation and rapid European integration of the region." Knežević pointed out that establishing cooperation of the companies in tourism sector is of utmost importance, as thus the countries from the region will approach. He also said that the European crisis will still last so the region should turn to Eastern markets and Russian market. President Josipović has become the political patron of Summit100, following presidents of Serbia and Slovenia Boris Tadić i Danilo Tirk. Summit100 business leaders of South-East Europe – A new deal for a new age, which gathered business leaders from Serbia, Slovenia, Croatia, Bosnia and Herzegovina, Macedonia and Montenegro was held for the first time in Aranđelovac, on 6 and 7 October 2011. At the very beginning I would like to express my gratitude to Mr Bill Clinton and his Foundation for partnership and words of support to the best Montenegrin students. I would also like to thank to partners in the just presented initiative, City of Podgorica and our mayor Mr Mugoša, and EPCG and Mr Malerba for participating in our joint project of energy efficiency Podgorica – City of the Future. Although a decade has passed, I feel tremor each time I stand in front of these young, successful people. Tremor for what I should say to them and for responsibility my generation feels wondering what we have achieved and what we will leave as heritage to the new generation of leaders that are receiving awards tonight. The moment we are living is challenging. The system of values we used to adhere and we still adhere is challenging. It is challenging for the society. There is plenty of insecurity, plenty of uncertainty. It is difficult to orient oneself and find secure, rapid and exact pathways. However, at the same time, that is a pleasant, unique challenge, as it leads to the formation of new paths and new ideas and new visions. My generation experienced similar situation, when a society we grew up in was disappearing. That situation was hard and uncertain, but what gave us force is the faith in what you know, and determination and self-confidence provided by knowledge, in order to realize the vision you believe in and you love. Experience proved that the success of a vision is reflected in the benefits it had for the others. Therefore, at this moment, I dare say that our faith in the future lays in YOU and your colleagues from previous generations and in the power that YOURS excellence and originality have in order to change the society and create new, better worlds. Be courageous and confident about the values of what you have learned, because that is an absolute value for eternity. Knowledge is the key word of 21 century. Knowledge is the main resource, main instrument, and main engine. Educated young people as you are, represent an investment which can only bring good to our society. Business community and the state should and will always support talent and human potential. It is your duty to make use of your knowledge and to share it generously with the others. And most importantly share love, spread love, love the others, love the society and community and love the future. That is the message I used to repeat to myself and that is what I would like to convey now to you. That creative and positive force is immeasurable and it will overcome the crisis of every period. In today's times of crisis it is necessary to share kindness, and to show solidarity, humanity and affection. That is the guarantee for your future, and you are the guarantee for the future of Montenegro. Nevertheless, I am sure that your historical and future role received more than enough polite compliments and flattering. Thus, take up immediately your share of rights and burden in carrying on with societal work, based on knowledge and skills the new generation brings. Be proud because the future of Montenegro is in your hands, the future ever more European and more global. You will represent us in Europe and in the world; you will represent Europe and the world here. And I am sure you will do that brilliantly. On May 22, 2011, President Clinton will travel to Montenegro. While there he will, at the invitation of Dr. Dusko Knezevic, President of the Atlas Group and member of the Clinton Global Initiative (CGI), deliver the keynote address at the Balkan Networking for Social Empowerment Conference. Organized by Government of Montenegro and the Atlas Foundation, and inspired by President Clinton's philanthropic initiatives, the conference will gather Balkan leaders from the non-profit, political, and business sectors, with the idea of establishing a private-public network that will work on finding a cross border model of sustainable social empowerment. After the unfortunate occasion of devastating 5.4 Richter earthquake, which has, in the night between Tuesday and Wednesday this week, hit the area of Kraljevo Municipality and its surroundings, and resulted in killing two people, and injuring a large number people, causing a considerable material damage, Atlas Group will donate ten thousand Euros for the reconstruction of the Municipality of Kraljevo. In addition to financial support, Atlas Group has offered Studenica Health Centre in Kraljevo, assistance in care of injured and patients, by offering 270 hospital beds in Meljine Hospital in Meljine in Montenegro, and its medical staff at disposal in providing medical assistance to patients. The velocity of the regional integration into the European Union will depend on a larger scale from the amount and level of capitalization, how much money has been retrieved from admission funds, reaching better rate for the region and private and institutional investitors capital arrival – said Dusko Knezevic, Atlas Group President in World Finance interview, the most prestigious economy magazine in the world. He has pointed out that during this year and 2011, it is expected that Montenegro and the regional countries will still be under the influence of the Global Economic Crisis. Knezevic also emphasized that Atlas Group is fairly well diversified, which has allowed it to withstand the effects of the economic downturn. Not only did the Atlas Group management maintained the stability, solvency and liquidity of the Group and all its members, but in three banks managed to report a profit in 2009. It is very important that bureaucracy as well ones who do the foreign investments promotion to are more flexible in order to help the investors to realize their project, because this is the only way for the region to move forward – said Knezevic. – Reducing bureaucracy is helpful too and that is just as true for Montenegro as elsewhere. There are several West European countries in which you can found a company over the internet. - It is inevitable that the region would be quite badly affected by the global crisis, as it is very dependent on foreign investments, notably from United States, European Union and Russia – Knezevic said in the interview. Investors and providers of capital have adopted a “wait and see” attitude, staying on the sideline until the situation improves. Atlas Group President has explained that there is still a possibility that events may take a turn for the worse once again, as some economics predict a scenario in which contagion from problems in Greece affects Spain, Portugal and other Eurozone countries. - Greek Banks and investors, together with Austrian banks, are among some of the largest investors in this region, so if they experience difficulties this is likely to have some knock-on impact on the region – said Knezevic for World Finance. It is evident, however, that mainly developed countries are already beginning to recover, if hesitantly. Hopefully, investors from these countries will gain confidence and returning to invest in Montenegro and the region, bringing the new capital with them. Montenegro must have foreign investments and this is one of the ways to increase our competitiveness compared to other investment destinations. Economic citizenship program must be fully transparent process, pursuant to EU regulations. Completion of Atlas capital center in the near future will mark the end of crisis, indicating the beginning of new investment cycle in Montenegro – Knezevic said. Podgorica – “Economic citizenship is not a new thing in the world and there are such programs in legislation of many countries. Comparing to them, I think that the price of a half of a million is too low. Montenegro must have foreign investments and this is one of the ways to increase our competitiveness compared to other investment destinations.”- Dusko Knezevic, Chairman of Atlas Group, said for “Pobjeda”. He emphasized that essential for this program would be to be well designed and promoted, to determine, from the very start, the target groups and profiles of investors to be attracted this way. It must also be fully transparent process, pursuant to EU regulations. Based on all these prerequisites, economic citizenship program has my full support and I will personally try to promote it since I have a lot of friends and business partners from Asia, Near East, Russia, Serbia and other European countries, having direct interest in application. Could starting the second phase of project Porto Montenegro as well as completion of Atlas capital center be evidence of deathbed of global economic crisis and that we might see better days? - Construction of these two projects has started immediately before the crises broke out meaning their implementation was in very hard conditions. In my opinion, it is very important that our operation has neither ceased nor been questioned, especially because of participation of foreign assets. These are two very important projects and I think their completion in the near future will mark the end of crisis and indicate the beginning of the new investment cycle. Montenegro has been trying to be profiled as elite tourist destination. What is your assessment of present promotion and general development of Montenegrin tourism? - Montenegro is a young country with tourist capacities not known enough on the world market. Because of that, it is very important to be presented constantly at fairs, in foreign media as well as in sports and cultural events worldwide. The most important is to work on branding Montenegro as tourist country, having all beauties, unspoiled nature and numerous resources which will attract tourist from all around world. You are one of a few businessman who operates successfully even during this crisis. What are the plans of Atlas Group, speaking of investments? - Majority of activities related to completion of Atlas capital center in the several next months and which financial structure will be entirely completed. Besides that, works are starting on the location of current Jadranski sajam in Budva. We realized that job in cooperating with investors from Great Britain, from Future capital partners. Atlas Group will there build one of the most modern expo centers in the region and it will be finished in one year period. On the other hand, our partners will build luxury hotel, with Windam, worldwide known brand. We will also continue valorization of Meljine complex, which has recently become our property. Foreign investors also have a great deal of interest both in hospital and hotel part of this complex, and we are currently negotiating models of their participation. At the same time, we work intensely and are in contact with foreign investors. We are about to sign partnership contract with Turner Constructions on establishing joint company for South East Europe. When can we expect completion of works on the most modern building in the region – Atlas capital center? - It will be first building in Montenegro, and one of rare one in the region, with so called green certificate, because of the energy efficiency system. We are doing finishing works and at this pace, apartments will have been finished by end of the year, and entire interior and business part by the spring next year. Do business people in the world think of Montenegro as of destination safe for investing and what should be done to make even more investors place their assets here? - As I have already said, Montenegro is quite a new investment destination and a lot has to be done on the promotion in the world. What attracts investors more is simplicity in operations, easier and expeditious procedures and transparent legal frameworks. In some countries, you just need to go to a law or consultant office, and they will finish entire process of registering company for you, obtaining licenses, etc. This is the course Montenegro should take, meaning that it is necessary to make further simplification of procedures, law amendments relating to establishing and operations of foreign companies as well as facilitation process of employing foreign managers. These are presumptions which will attract new and keep present investors, and make Montenegro desirable investment destination. Atlas Center today signed a contract for the second part of the loan with Marfin Egnatia Bank of Greece. Costas Vitakis, Director of Marfin Bank, has put his signature on the loan agreement, on behalf of this well-known Worlds Bank. Despite the global economic crisis, Atlas Group is currently building technologically most advanced building in the region, Atlas Capital Center, opening is expected in late 2010. On this occasion, Mr. Costas Vitakis said that Marfin Bank has recognized this project from the beginning as one of the most promising regional investment. "I am pleased to see the completion of this project, and that Marfin Bank, together with the owners of Atlas Capital Center provided funding and helped project implementation. Concerning the global economic crisis, with cooperation between our bank, the royal family of Abu Dhabi and the Atlas Group, the project is almost done, respecting the highest standards and quality. I'm very glad now that it is certain, Atlas Center will open doors and be a symbol of Podgorica in November, "said Vitakis. On behalf of Atlas Capital Center, executive director Maja Stjepovic said that "the Atlas Group and Capital Investment, investors in this project, showed that at the time of global economic crisis, which particularly affected the real estate market, we can now underline the financial structure for this project worth over 120 million euro. Jassi Al Seddiqui, representative of Capital Investment and the Royal Family of the United Arab Emirates said that their first project in cooperation with partners from the Atlas Group proved very successful and will soon consider new investments. Atlas Capital Center is a facility located in the business - administrative part of Podgorica. The Center offers over 90,000 m2 of modern design under its roof, a new chance to live, play and work. Atlas Capital Center will offer 13,000 m2 of housing space, which consists of 90 residential apartments - a concept that has not been represented in our market. The Center offers over 13,000 m2 of commercial space and even 40.000 m2 of office space, of which 8500 m2 will take place for the hotel operator. Concerning requirements such building sets, for the first time in our market, one company will take care of the entire building and all the needs of its residents (Facility Management). The object was to justify the highest level of technical, technological and artistic equipment, both in the apartment, as well as the business part of the building. During the construction materials used are of superior quality, especially in final processing. As one of the major problems in all cities today, including Podgorica, is parking space Atlas Capital Center has constructed 800 underground level garage spaces. The center is truly representative of life concept "LIVE, WORK, ENJOY”. With an exception of Atlas Capital Center and some other examples of high quality building, there is a very small number of comparable facilities in our region. Speaking of demanding clients, and those who still have only one criteria, and it's quality, Atlas Capital Center now has more and more residents in their rooms. Construction of this quality is easily recognized by Marfin Bank, which confirmed that the trust always justifies the good work. President of the Atlas Group attended "Clinton Global Initiative"
President of the Atlas Group was invited by the president of "Clinton Global Initiative," Bill Clinton, to attend the plenary session on May 13th , in New York. At this session, held at the Hotel Sheraton, in the presence of government officials, the president of prominent foundations and corporations, former U.S. President Clinton spoke about the importance of philanthropic arrangements and cooperation between the public and the private sector, nongovernmental organizations and world leaders, in order to unite forces in dealing with most urgent global problems. The organization defined the sphere of action to concentrate on in next year: introducing new trends in health, education, equality of work, implementation of new technologies and green economy. In the meetings that were held after the plenum, the president of Atlas Group considered with other members, actual projects and possible actions for the implementation of new technologies in education and new social and environmental standards. The organization of former U.S. President Clinton has so far joined more than 100 current and former heads of the state, 14 Nobel Peace Prize winners, several hundred leading global directors, philanthropist, directors of the most effective non-governmental organizations and prominent personalities from the world's media (Barack Obama, Bill Gates, Steve Jobs, Princess Rihanna, Al Gore, Ban Ki-moon, Hillary Clinton, Kofi Annan, Jimmy Carter, Madeleine Albright, Warren Buffett, Matt Damon, Demi Moore, Brad Pitt, Ted Turner, Rupert Murdoch). These and other members launched 1.700 initiatives of 57 billion dollars which improve the lives of more than 200 million people in 150 countries.Participants analyzed the biggest global challenges, considered the most effective solutions and build secret partnerships that allow them to create a positive social change. During his stay in New York, the delegation of the Atlas Group conducted a series of meetings on the New York Stock Exchange with a well-known investment companies Merrill Lynch, Bank of America, Barklis Capital and Bloomberg television. Knezevic also met with the executive director of New York Stock Exchange, Lawrence Liebovic, with whom he discussed the possibility of cooperation with Montenegro Stock Exchange and implementation of U.S. business experience. At meetings with stock exchange officials and traders main target was to consider activities and opportunities for internationalisation of Atlas group and to make potential partnerships in projects implemented in our country. At the most prestigious tennis tournament in the region Serbia Open, a member of ATLAS GROUP from Cyprus, dealing with international currency trading ATLAS eFX is "Silver Sponsor" again in 2010. Cooperation is achieved in order to promote the most modern type of investment today and the possibility for strong domestic companies to reduce, control and manage currency risk exposure and thus increase the profitability. In the world this kind of trading has a practice for many years and in our country is becoming inevitable as well. ATLAS eFX team brings together experts in finance who are a strong competition to all international companies and offers FOREX services for trading in the most modern way. Tournament begins with first qualifying matches and 2 May 2010 until the official opening of the tournament is expected May 3. The competition will participate in many famous players from the domestic, regional and international areas. In addition to the other players of the world, Novak Djokovic, tennis fans will have the opportunity to Dorcol be seen by the following names of world tennis: John Izner (USA), Stanislas Wawrinka (Switzerland), Sam Querrey (USA), Ivo Karlovic (Croatia), Viktor Troicki (Serbia ), Janko Tipsarevic (Serbia), Igor Andreev (Russia), Lukasz Kubot (Poland), Andrea Seppi (Italy), Fabio Fonjini (Italy), Evgeni Korolev (Kazakhstan), Horacio Zebaljos (Argentina) Olivier Rochus (Belgium) Leonardo Mayer (ARG) Florent Serra (France), Michael Russell (USA), Richard Gasquet (France), Karol Beck (Slovakia). Semifinals will be played on Saturday May 8 and the name of the winner for 2010 will be known on Sunday 9 May after the finals. It is expected to be good weather and a full seat occupation. Promoter of the tournament will be former Australian Open champion and U.S. Open, now a retired Russian tennis player, Marat Safin. Belgrade Mayor Dragan Djilas, has expressed confidence that the tournament will be even more successful than last year, when the Association of Tennis Professionals (ATP) declared the best in the world in its category, a series of so-called 250th. Croatian singer, celebrity from Split, Ms. Severina Vuckovic stayed last weekend in Podgorica where she performed a video shooting for her new song “Lola”, from the “Miligram” compilation, in a luxurious ambient of an apartment in Atlas Capital Center. Atlas Capital Center the business residential and commercial complex of, the-cutting edge in technics and technology project in the region, hosted Severina, whose head producer Aleksandar Kerekes decided to come to Montenegro and shoot a video for the song “Lola” in a luxurious apartment of Atlas Capital Center and on Montenegrin seaside. A press conference was held in Media Center in Hotel BW Premier, Hotel Montenegro, where conference members gave statements about Atlas Capital Center in Podgorica, video shooting for song “Lola” and future plans: Vuko Dragasevic, the General Manager of Atlas Group, Aleksandra Golubovic, the Executive Director of CENTURY 21 Capital Real Estate, the official representative of Atlas Capital Center and Severina Vuckovic, Croatian celebrity. As a welcome present and in the name of the Group and Atlas Mont Bank, Mr. Dusko Djukanovic, gave Severina a “Gold” credit card and stated: “Best wishes in spending money as much as you can, but of course manage your financial obligations”. 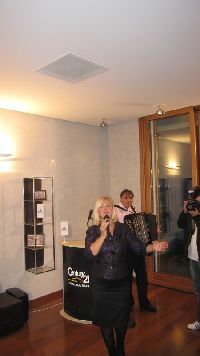 In the name of an official sales representative of Atlas Capital Center, CENTURY 21 Capital Real Estate, Executive Director, Mrs. Aleksandra Golubovic stated that CENTURY 21 Capital Real Estate is very pleased to have Severina in their showroom to make the video for song “Lola”, and by doing that additionally help the promotion of luxurious apartments in Atlas Capital Center.” I sincerely hope that Severina will come back and attend the grand opening of the Center”- stated Mrs. Golubovic. “We came to Montenegro to shoot a video for the song “Lola”, and I hope that you will like the idea and video all under the coordination of Aleksandar Kerekes. I have to state that I have a very pleasant experience with Atlas Group who confirmed that it has always recognized the quality and artists, and that they are willing and unreservedly to come forth. I will definitely recommend the Atlas Group as a partner for cooperation”- said Severina. The General Director of Atlas Group, Mr. Vuko Dragasevic, confirmed the successful cooperation with Severina. “As we successfully hosted Hollywood star here in Montenegro last year, this year we have an honor to have Severina as our guest and a co-worker on the promotion of currently biggest project in the region – the Atlas Capital Center. We will most certainly give efforts to hear Severinas’ voice as well on the grand opening of the Center”- stated Mr. Vuko Dragasevic. Atlasmont Bank is declared to be the best bank in Montenegro, and Atlas Group the best financial organization by world financial magazine, the “WORLD FINANCE”, based in London. During the ceremony in London, reward was delivered to the president of Atlas Group and the president of the Atlasmont Bank board of directors, Mr. Dusko Knezevic. “WORLD FINANCE” is the most prestige world financial magazine who has on its pages some of the biggest names in the world of finance. 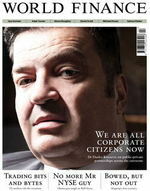 In its latest edition, May and June, they published an article about the history and business of Atlas Group. In text about Atlas Group, under title “Branding the Success”, was given the detailed description of business activities so far, completed projects and project planed to be managed in the future. Atlas Group was given the recognition for quality in management activities so far, who contributed to stability and high liquidity of the Group and its members in the period of world economic crisis. Emphasis was given to the international character of the Group – its development on EU markets and Russia. Magazine, among other, stated that Atlas Group has internationalized its business by owning the ABM bank in Moscow and by opening a regional office in Cyprus, who is tending to become a bank. This great recognition for successful development was received during the greatest economic crisis ever. Atlasmont bank has no difficulties in keeping high liquidity and regularly provides all services to its clients. Client and deposit outflow is minimal and definitely under the level compared to competitive banks. It is important to say that Atlasmont bank created this status in pre crisis period, when it ensured the business stability by keeping the traditional principles of banking business – stated in “WORLD FINANCE” magazine. On the regional conference for finance and investments in South East Europe, held in Dubrovnik on 20th and 21st of October, Atlasmont Bank from Podgorica was officially rewarded as the best bank in Montenegro in 2009. Decision for delivering this gratification was announced one month ago by British institution EUROMONEY, who also organized this conference. During the ceremony the director of EUROMONEY, Mr. Richard Ensor, stated that Atlasmont Bank wise leadership significantly came up front in the period of crisis. Landing was put under control, bank received an international rank for credit rating, business was successful, and for receiving this reward it is very important the way bank was managed during the crisis period. Atlasmont Bank CEO, Mihailo Banjevic, stated on EUROMONEY conference in Dubrovnik that reward is inspiring but also expected. He stated that EUROMONEY reward for 2009 shows that Bank is on the right track. Credit rank of B1 provided by Moody’s was one of the main factors in EUROMONEY decision for the best bank in Montenegro in 2009, and rank was provided concerning great capital adequacy, high liquidity and positive profitability trend since establishment of the Bank. Regional EUROMONEY conference organized annually, every October in Dubrovnik, was attended by high representatives of regional governments, Central and commercial banks, and other corporations and financial institutions from the region and further. Atlas Group, one of the greatest companies in this part of Europe, doing business in five different countries, marked its twentieth anniversary by official sale start of Atlas Capital Center. Atlas Capital Center will contempt 90 apartments ranging from 80-310 m², office space of nearly 15.000 m² and commercial area of 12.700m², while area planed for the hotel purposes is 14.500 m². All Atlas Capital Center residence and guests will have where to park their cars, on 812 parking lots in the four level of underground garage. Atlas Capital Center will have its own firm for managing the Center and will take care of all users needs on the highest level and will meet clients needs and desires in a very short notice. President of the Atlas Group, Mr. Dusko Knezevic, on the official opening stated that the first faze of construction works started two years ago are now finished, one month pre schedule. “Project is one of the biggest in the region and is done in partnership with Capital Investment, company owned by the Royal family from UAE. I consider that this formal sale start will bring great benefit for both companies. Up till now we have received 200 requests for apartments purchase. Priority in the Atlas Capital Center is to resolve a hotel matter with one of the great hotel chains and to find up to three big tenants. We expect to announce their names in next 3 months, and in second half of 2010 to make an official grand opening. Together with our partners from Capital Investment we designed the Atlas Capital Center as a modern facility, which will make Podgorica a recognizable Mediterranean Capital. A small part of it you can see in the facility where we stand here today, it is a model of one of the apartments in its natural size – stated Mr. Knezevic. General Manager of Capital Investment, Ali Almansuri, stated that his desire is for Atlas Capital Center to be one of the best projects in the region and he is very pleased that everything is being done in planed time schedule. “I am thankful to all participants in this construction which we obliged to finish next year”- stated Mr. Almansuri. Mayer Miomir Mugosa stated that construction of a project like Atlas Capital Center in time of crisis means a lot. “We will wait for your decision concerning several locations we negotiated for some time already and we are ready to start their realization at any time. We shall see when will the hotel jigsaw be solved, as it is good for the main players to be in our premises. Atlas Group and Capital Investments at the end wished to all that the next meeting should be in several months in the same place, when this facility will shine with doors wide open. Dusko Knezevic President of Atlas Group is speaking to attendants during the Atlas Capital Center Mock Up opening. Ali Almansuri General Director of Capital Investments Group is speaking to attendants during the Atlas Capital Center Mock Up opening. Milomir Mugosa Podgorica Mayer is speaking to attendants during the Atlas Capital Center Mock Up opening. Open agency CENTURY 21 Capital Real Estate to represent Atlas Capital Center, from left to right Director Aleksandra Golubovic and sales manager. Press conference was held today at Avala Resorts & Villas hotel, regarding the visit of Pamela Anderson to Montenegro and Atlas Group. „Atlas Group has been promoting Montenegro and the region by doing business people throughout the world, such as Al Nahijan Royal family from Abu Dhabi, Philip Kotler and Vitali Klitschko. The business relationship with Ms. Pamela Anderson is very significant and is a begining of cooperation on Atlas Capital Center and Meljine Spa projects, which Ms. Anderson had the opportunity to visit. Visits and cooperation with celebrities is not important only for promotion of Atlas Group but for national promotion of Montenegro too“ said Djordje Djuric, Atlas Group director. „There were several occasions where I have heard from my business partners that Montenegro offers excellent investment opportunities and that my client, Pamela Anderson, should get involved. We were lucky to meet Atlas Group through mutual friends from Abu Dhabi, so Pamela asked me to personally visit Montenegro in February and confirm the quality of Atlas Group and Montenegro. As previously announced in February, Pamela came to visit Montenegro and to consider all business cooperation possibilities. I would like to thank Mr. Knezevic and Atlas Group for having our visits perfectly organized, as well as for great business cooperation and hospitality“ Peter Usher, Pamela Anderson’s manager said. „It is my pleasure to announce that our official cooperation started today as I opened a banking account in Atlas Mont Bank. The first transaction will be a $10.000 donation to the Orphanage Center in Bijela. As you know, my manager had previously visited Montenegro and, as one very skeptical Englishman who rarely gives compliments, returned with very favorable impressions. We have decided that this is a country in which we are anxious to invest in for the future. Peter’s enthusiasm convinced me that I had to visit Montenegro personally. His words did not do the beauty of this country justice. Yesterday I spent the whole day visiting many locations as I could manage and spoke to Mr. Knezevic and the people from Atlas Group. During these visits I have seen Atlas Capital Center and a outstanding mock up apartment of ACC. While cruising on the Adriatic sea I also saw a beautiful place, Przno, where Atlas Group will build apartments. I would like to have a place there. We also spent a long time exploring the site of the spa at Meljine, which I believe is going to be an extraordinary and world-class institution. We have agreed to enter into a series of meetings to explore the possibility of collaborating on this project from both a creative and a business perspective. I have long had a visino of the kind of spa I believe the world needs, incorporating my ideas about lifestyle and the arts as well as natural good health and I am hoping that Meljine and Atlas may provide the vehicle for this vision. One of my other business priorities is the international launch next year of my fragnance and product line “Malibu by Pamela” which premieres in the US ina a couple of months and I am hoping we can ties this all together. These meetings will begin at once. After the press conference, Ms. Anderson, accompanied by Mr. Dusko Knezevic the President of Atlas Group, posed for the reporters with her new Atlas Mont Bank banking card. Atlas Group has officially confirmed today that Pamela Anderson, a Hollywood star, is coming to Podgorica on Monday, July 13th. Peter Asher, Pamela’s manager, visited Montenegro few months ago, and returned to Los Angeles with positive impressions. His conclusion was that this beautiful country should be visited as soon as possible. Since Pamela promotes a healthy life and ecologically clean environment, she became very interested in two Atlas Group projects: Atlas Capital Center in Podgorica and medical and SPA center in Meljine. Considering locations and construction style of Atlas Group projects, which respect not only organic but also ecological building principles, and after her manager visited Montenegro, Miss Anderson has decided to personally see the quality of these projects and their natural surroundings. From her manager’s reports, Pamela Anderson has concluded that Atlas Group projects are exactly what she is looking for in real estate business. Initially, Miss Anderson has heard of Atlas Group and its business in February this year in Abu Dhabi from her business partners. Immediately and without any hesitation, she accepted the invitation from Mr. Dusko Knezevic, the president of Atlas Group. Atlas Group, through the way of doing business and its international presence, projects a real picture to the world about the region and business possibilities which this country can offer to the potential investors. Business cooperation with Pamela Anderson is only one of the ways to show that good business practice has no limits. Hollywood star Pamela Anderson has officially confirmed yesterday in Los Angeles that she will visit Atlas Group mid-July, as per previous announcements. Since Pamela promotes a healthy life and ecologically clean environment, she became very interested in two Atlas Group projects: Atlas Capital Center in Podgorica and medical and SPA center in Meljine. The location and construction style of these projects respect not only organic but also ecological building principles. “When my business partners from Abu Dhabi first mentioned Montenegro and business of Atlas Group, it sounded fantastic. Country with such beauty and fascinating history captured my interest immediately. I have heard that Montenegro is country which respects ecological principles which I strongly support. Since I love to combine my interests my professions often overlap, being an actress and an entrepreneur. Combination of my interests brings me good business opportunities. Real estate is only one of the projects I am involved in. Everything I heard and read about this country fascinated me, so I accepted without any hesitation the invitation of Mr. Dusko Knezevic, the president of Atlas Group, to visit Montenegro and explore options of investing in Atlas Capital Center and medical and SPA center in Meljine. At the moment, all my money is invested in real estate and I consider it to be a smart move. For some time now, I have been looking for a location on which I could realize my dream project: medical and SPA center which respects values I believe in: ecological principles, healthy environment and organic food. The project would not interfere with the natural environment it is situated in. Further, it would offer enjoyment in art, music, modern design and excellent entertainment. All those things are extremely important for our life! My manager, Peter Asher, visited Montenegro few months ago, and returned with excellent impressions and with a conclusion that this beautiful country should be visited as soon as possible. I believe that Atlas Group projects are exactly what I am looking for. I am excited about the visit and about the fact that I will fulfill my dream. We have already started the process of opening bank account in Montenegro and are very optimistically entering business cooperation with Atlas Group and their partners. I am very excited” said in Los Angeles American actress Pamela Anderson. In the past several years Atlas Group has expanded its activities and its presence internationally, not only through its member companies but also through prominent business partners in Montenegro, Serbia, Croatia, Slovenia, Russia, United Arab Emirates, Australia, Greece and Cyprus. Business cooperation with Pamela Anderson is only one of the ways to show that good business practice has no limits. Clients of the Invest Bank of Montenegro have gotten an opportunity to take part in trading on the global financial markets, currencies (Forex) at first, and very soon after other markets including stocks, commodities, derivatives and other securities. Furthermore, in a month or two, IBM clients will be able to trade on domestic (Montenegro) as well as other markets in the region. Online trading, we believe, will be playing a special role in domestic economy by attracting direct foreign investments while giving an opportunity for local investors to trade the foreign markets. In this revolutionary venture for this country and the region, IBM has teamed up with ODL Securities, a broker dealer company - one of the two biggest foreign exchange players in Great Britain - which provides a technical support for IBM. IBM clients who possess a foreign exchange account with the bank as well as the new ones who are interested in online trading need to open an investment account in order for them to trade directly on the IBM Trader platform in real time. For more information on how to open an account please visit web page E-trading. ATLAS-FX is proud to support the vision of the Serbia Open event which is trying to position itself in the global tennis map. We have seen the commitment and dedication of people to make the Serbia Open not only the sports spectacle but to promote values of competition and fair game. ATLAS-FX sees this sports event as the promotion of the company as the future activities of this emerging company will be oriented toward the global markets and we are certain that being present in such event will make a difference in our future work. ATLAS-FX will continue to support global sport competitions in the future. World renowned agency Moody’s Investor Service has assigned B1 rating to Atlasmont Bank and it therefore became the first bank with the assigned rating not only in Montenegro, but in the whole region. While assigning the rating, Moody’s agency emphasized that the given rating reflects adequate historic financial fundamentals of this Bank, capital adequacy of 14.3% as of September 2008, good liquidity, and profitable income statements in the past six years. The assigned rating, in the opinion of Moody’s agency, confirms stable perspective of Atlasmont Bank. Moody’s Investors Service is one of the three greatest world agencies dealing with assigning ratings to commercial institutions and states. The second business round table between the government of Serbia and domestic entrepreneurs was held in Belgrade`s Sava Center. This event was organized by Economist Media Group and Atlas Group was the general sponsor. The main topic was current world financial crisis. Mr. Vuko Dragašević, the executuve director of Atlas Group, represented our company at this event. He emphasized that Serbia should have by the end of 2008. a clear strategy in many segments, and special attention must be paid to the stimulation for the Serbian investment abroad, which were not often discussed untill now. Encouragement is needed especially for the investments in the SEE region, which is the closest to Serbia. Last year Serbian investments abroad amounted more than a billion Euros, 65 percent of which went to the Republic of Srpska, followed by Slovenia, Macedonia, Montenegro and Russia. Investments in Croatia are minor up to date. It is especially important that the Government supports domestic businessmen and removes the barriers for the entrance in the neighboring markets. Establishing a Serbian business network, regaining the old reputation of the Serbian Chamber of Commerce abroad, and changing domestic regulations in order to stimulate investors from Serbia – are only some of the preconditions for the development of Serbian investments overseas. 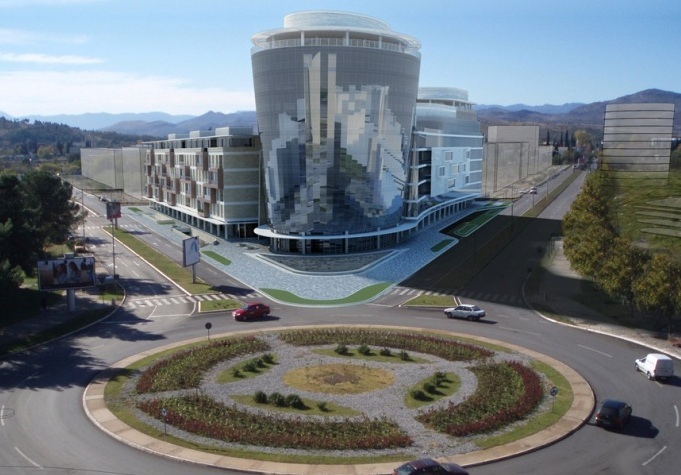 "ATLAS CENTAR d.o.o., Podgorica issued the public tender for the selection of the best bidder for the continuation of the construction works on the building Atlas Capital Centar in Podgorica. Representatives of Atlas group in the presence of the montenegrian water-polo players, made a two part donation : money and 140 gifts bought with the fund collected from the Atlas group employees. This way Atlas group continues with practice of helping humanitarian projects and developmnent of social responsibility. Representatives of Montenegrian government and the consortium led by Invest Bank of Montenegro (IBM ), a member of Atlas Group, signed today in Podgorica, a contract of purchase and investments in military-medical centre of Meljine. Contract was signed by the minister of finance Mr Igor Lukšić and president of Atlas Group, Mr Duško Knežević. Consortium paid EUR 25 million for Meljine, and in the next seven years has to invest 120 million more in development of hospitals and hotel capacities. The members of consortium are: „ATLAS CAP“ Podgorica,Atlasmont bank, Invest bank of Montenegro, and special hospital for internal diseases „Sveti Nikola“ from Kraljevo. Professional guarantees are provided by „Cromwell hospital“ from London and hospital „Monte Carlo life check“. Future complex in Meljine will have a hospital with all necessary equipment for plastic and cardiovascular surgery, diagnostic centre and centre for rehabilitation. By the future plans there will be a hotel and a complex of luxury apartments, with a heliport as well. Mr Duško Knežević stated that this contract is a good business opportunity and can pave the road to other investitors willing to come to Montenegro.This deal has shown that Montenegrin government is looking after the consortium and foreign and local investors, and i it is a only way to conduct business in times to come. Meljine complex will be completed in 2014. To mark the start of construction on their new high-end mixed-use business, retail and residential structure in Montenegro, investors Atlas Group and Capital Investment (UAE) organized a reception at the Atlas Capital Centre building site in Podgorica. Representatives of the Montenegrin Government, members of the diplomatic corps, business associates and future clients of the Atlas Capital Centre all attended the lavish reception held at the downtown building site. Mr. Dusko Knezevic, President of the Atlas Group, delivered a speech to those assembled about his vision for the project. Mr. Branimir Gvozdenovic, Minister of Economic Development in the Government of Montenegro and Mrs. Hafsa Al Ulama, Executive Director of the Capital Investment also gave speeches for the occasion. Atlas Capital Centre with its unique and modern design and its superior location, which offers easy access to all the best that Podgorica has to offer and links to all other major destinations throughout Montenegro will offer tenants and residents access to a completely NEW LIFESTYLE. The building site is located between two boulevards - Cetinjski put and Vojvode Ilije Plamenca and comprises over 84. 600m2 of usable area. The finished project will consist of 90 business apartments, fully equipped to the latest European standards, a hotel and contemporary office and commercial spaces, all with an accompanying three-level garage. Atlas Capital Centre was designed according to European Directive 2002/91/EC standards, which emphasize the importance of energy efficiency in the design of new building projects. The Atlas Capital Centre project is being designed to meet the most stringent of regulations laid out by this directive in terms of energy and thermal efficiency. The structure will be built under a construction license issued by the Ministry of Economic Development on 18th June 2008 and in cooperation with the progressive, world-leading construction management and consulting company, MACE. Construction on the Atlas Capital Centre will be completed in 2010. Atlas Group is a leading company in the fields of banking, financial services, insurance, real estate, manufacturing, trade, media, education, culture and sports, serving as an exemplar of high quality standards and best business practices throughout South-Eastern Europe and in the Balkan region. Under the umbrella of the Atlas Group are: Atlas Mont Bank, IBM, AtlasMont Fond, CG Broker, Atlas Life, Atlas Retirement Fund, Fin Invest, Jadran Fair, Mediteran University, Montenegro Express, RTV Atlas, etc. Capital Investment is based in Abu Dhabi, UAE. From its beginnings in 1999 as a company investing in real estate and local capital markets, Capital Investment LLC has grown rapidly to become a leading investment house in the region with diversified business interests across numerous sectors. Capital Investment directed its business on a Montenegrin territory, where together with Atlas Group invested in two new projects – Atlas Capital Centre and Meljine. Mace is one of the world's largest and most diverse project and construction management companies, with a great reputation for finding the best solutions to complex construction problems. This company proved its ability to offer high level services through defining projects, design and process implementation, starting with identification of the project requirements up to the final phase and maintaining services. The awards Mace achieved in the fields of construction in the years 2002 and 2004 proves that this Company has an ability to support the interest of the client. 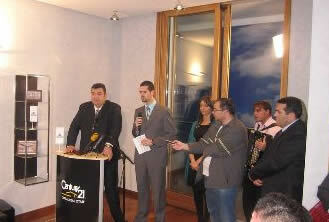 Aqua Monta was awarded with three gold medals for quality at the last international Agricultural Expo in Novi Sad. Representatives of Atlas Group, which is the owner of the water bottling company Lipovo, said that this award comes from one of the most important Expos of this kind in the Southwest Europe and is very significant for the further development of such young and prosperous brand. This is factory’s first year of operations, being present in Serbia and Montenegro. Vladan Draskovic, the executive director of the factory, received this award at the ceremony. Aqua Monta is has such low mineral content that can be compared with the top quality bottled waters worldwide. It has a very characteristic low content of iron and manganese (<0.01 mg/l). ABM Bank’s opening ceremony was held at the Golden Ring hotel in Moscow today. 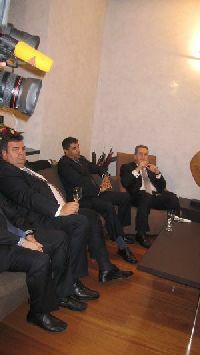 The Atlas Group president, Dusko Knezevic, and ABM Bank general director, Oleg Milovidov greeted all the guests with a cocktail party. This is the first case in Montenegrin history that one domestic bank opens another bank outside the country borders. ABM Bank is, also, the first bank in Russian Federation owned by a bank from a former Yugoslav republic. The Montenegrin Prime minister, Milo Djukanovic, addressed the audience stating that opening of the first Montenegrin bank abroad is an important contribution to the overall improvement of the business cooperation between Russia and Montenegro. The Governor of the Central Bank of Montenegro, Ljubisa Krgovic, presented that two Central banks had signed the Act on banking supervision, so ABM Bank will be the first entity being supervised under this Act. The ceremony was attended by the Montenegrin Ministers of foreign affairs and justice, Milan Rocen and Miras Radovic, the State funds directors, Dragan Lajovic and Radivoje Zugic, as well as the highest representatives of Montenegrin and Russian industries. Canadian businessman Peter Munk was in a formal visit to Atlas Group in Podgorica, welcomed and hosted by the group’s President Dusko Knezevic. Since the two companies have already joined together in the bid for Montepranzo in Tivat, two businessmen talked about possible future project that would improve the level and capacities of holiday facilities at the Adriatic Sea coast. „The accomplishment of all goals, of course, requires providing excellent conditions that should satisfy the needs of high demanding tourists such as top notch hotels and restaurants. Four Seasons hotels are the good example of that, and so is a golfing resort. We connected with Atlas Group and expect a successful cooperation where we can, soon, accomplish the goals that will increase the quality of tourism in Montenegro”, and he continued - “We heard only good things about Atlas Group. Today, the reputation of Atlas Group has leaped to the international levels, their accomplishments are exceptional. No matter how large the foreign investors are and how much experience they have, they always seek for a strong and high quality local partner, and we cannot imagine a better partner than Mr. Knezevic and Atlas Group”. Atlas Asset Management has obtained the licence from the Securities Commission of Republic of Serbia. This licence enables the management company to organise and manage an open investment fund, establish and manage a closed investment fund and manage a private investment fund. The portfolio manager, Marko Jovanovic, has announced that the first open investment fund will be registered and operational in the next month. This is the second investment fund under the Atlas Group roof. The first and very succesful fund, Atlas Mont fund, was established in Montenegro during the vaucher privatisation process of the Montenegrin companies. ABM Bank in Moscow has obtained the licence and is open for business, aiming to service those who have business and personal interests in both, Montenegro and Russia. Some of the available services are as follows: acount maintenance for legal entities, residents and non-residents; Internet bank-client; operation services for individuals, residents and non-residents; safe deposit boxes; letters of credit, nostro and loro; letters of guarantee, nostro and loro; checking; collection operations; bills of exchange; foreign exchange; money transfer to Montenegro, domestic money transfer and internatioanl money transfer; and loans, collateral loans and mortgage loans. 6. - 8. december 2007. Atlas Group was a part of the second Belgrade Real Expo, thus presenting its real estate projects in Serbia and Montenegro. This regional event at the Belgrade Fair gathered almost all important players of the regional real estate markets. This year the accent was put on the commercial projects that should raise the standards of living and working in Serbia. We have seen a few new concepts, such as the Block 26 project, that should change the look of New Belgrade and raise the attractiveness of doing business in this part of Europe. Atlas Group showed its leadership potentials with the projects in Blocks 26 and 65, as well as the projects in the old city of Belgrade. On top of that when we add the number of attractive locations in Montenegro, Atlas Group is clearly in a group of real estate leaders in this part of Europe. Learn about our projects at our Real Estate micro site. Hotel Splendid was the host of the first Real Estate conference in Montenegro, organised by the Ekonomist magazine from Belgrade, Real Estate Market in the Adriatic Region – the New Horizon. Among many prominent participants, experts and government officials, Atlas Group delegation was involved in every egment of the event. The largest projects on the montenegrin coast were presented to the wide audience. Mr. Vuko Dragasevic, the executive director of Atlas Group, was a part of the panel discussion over Tourism and development of the hospitality and leisure industry – current and future projects. Mr. Dragasevic agreed that montenegro needs more investments and efforts in developing a substantial infrastructure that would enable better flow of more international tourists. He, also, added that the coast has an insuficient number of high class luxury hotels and more luxury hotels means more wealthy tourists with more liberal spending habits. The main conclusion is that Montenegro is currently going into the right direction to take a piece of tourists from Croatia, Italy and Greece each year and become a recognisable ouristic destination in Europe. Atlas Group presented its largest projects such as Cape Mimosa with luxurious villas and hotel, Medical center „Meljine“ with exceptional potential for high class medical and SPA tourism, and Kamenovo Beach resort and Mogren Hill Luxury apartments and hotel complex with a see view to die for. Learn about our projects at our Real Estate microsite. Breaking ground for the new office building in Takovska St. This week we have started with initial phase works on our Takovska street location, where a future office building of 4,935 m2 will erect. This business building will be built by the modern standards and will be equipped with the state of the art technological, security and functional solutions. This office building will feature open office space layout that can be adopted according to tenants’ requirements and needs. The garage will be fully automated where car parking is regulated by a computer system that “files” vehicles in designated spots. The ground floor will be available for showrooms or other retail use due to the location attractiveness. 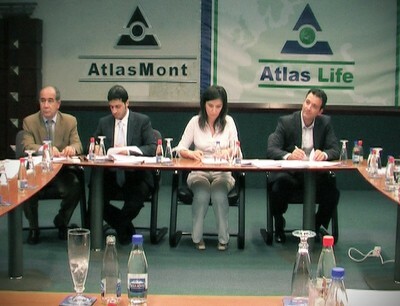 Capital Investment and Atlas Group have presented the plans for upcoming investments in Montenegro. The initial project will be the Atlas Business Center in Podgorica, worth about 100 million Euros, and the partners will create a joint venture with equal share. According to Mr. Slobo Buric, the Atlas Group Director for investments, groundbreaking will take place in September of this year and the completion is expected in 2009. Besides the business complex, this business center will have residential apartments and retail center. The total built area will be 85,000 square meters. The Investments Manager for Capital Investment, Mr. Jassim Mohammad Rafea Alsediki, said that the future plans for the investment fund, besides the business center and the Medical center in Meljine, are also oriented toward some other interesting projects in Montenegro. Mr. Vuko Dragasevic, the Executive Director of Atlas Group, and Mr. Alsediki agreed to present those plans once the negotiations are completed, most likely during this summer. During the three-day visit of Capital Investment to Montenegro, the member of the royal family from Abu Dhabi, sheik Haza bin Zajed al Nahijan, was a guest of Mr. Dusko Knezevic, the president of the Atlas Group. Last week in Abu Dhabi, Capital Investment from UAE and Atlas Group have signed the joint venture agreement for investing in the Atlas Business Center in Podgorica, with the total market value over 200 million Euros. This agreement was signed by Mrs. Hafsa al Ulama, the director of Capital Investment and Mr. Dusko Knezevic, the president of Atlas Group. Furthermore, the strategic alliance between Capital Investment and Atlas Group has been enhanced by forming of a consortium for the Meljine Military Hospital auction. Capital Investment is a part of the First Gulf Bank group from UAE with accomplished investments in the Middle East region, Seychelles, etc. In 2006, Capital Investment had a net profit of more than 100 million Euros. The First Gulf Bank from UAE has decided to invest around one billion Euros in Montenegro, as announced by their representatives led by the general director, Abdulah Mohd Saeed, during a two day visit in Montenegro. The Prime Minister Zeljko Sturanovic, ministers of tourism and economic development Predrag Nenezic and Branimir Gvozdenovic have talked to the First Gulf Bank representatives, who came as the guests of Mr.Dusko Knezevic, the president of Atlas Group. One day before they also met with the former prime minister Mr. Milo Djukanovic. Mr. Mohd Saeed said that the First Gulf Bank decided to visit Montenegro after they were invited by Mr Knezevic and Mr. Djukanovic, during their visit to UAE where they presented the opportunities for investing in Montenegro. The bankers have visited the Montenegrin coast and the north part of the country. They were presented by the investment possibilities in the Great Beach, Ada Bojana, Valdanos beach and other touristic resorts on the coast and mountains. The First Gulf Bank leaders have, also, been offered to invest in the energy sector, as well as in exploring of oil and gas sources on the Montenegrin coast. Very soon, a team of experts from UAE will visit and further analyze concrete projects and their feasibility. Montenegro is their choice for investing due to stable currency, proximity to Western Europe, and near entering the EU. The First Gulf Bank is one of the leading banks in the UAE, headquartered in Abu Dhabi with offices in Dubai and other Emirates. It is owned and run by a several sons of the late Sheik Zaed bin Sultan Al Nahjan. Last year it showed a growth of 45 percent in total value of EUR 300 million, which is about a half of the annual budget of Montenegro. The bank employs close to 2,000 people and has plans to open large financial centers in Singapore and Great Britain. The Arab investors have announced its strategic alliance with Atlas Group and Atlasmont Bank in Montenegro. Director of Atlasmont Fund, Velibor Milosevic, has confirmed that the First Gulf Bank is ready to invest around one billion Euros in Montenegro. Mr. Milosevic has visited the prime minster Sturanovic together with the leaders of the First Gulf Bank. “They are interested to invest in the Atlas Business Center that will feature over 80,000 m2 of office, retail and residence space in Podgorica” said Mr. Milosevic. This year’s 33rd Food fair hosted some 180 producers and distributors from 15 countries: Austria, Bosnia and Herzegovina, Italy, China, Hungary, Macedonia, Germany, Poland, Slovenia, Serbia, Thailand, France, Croatia and Spain. The ministry of agriculture of Montenegro, together with the Adriatic Fair, has offered special discounted participation for the local food producers. The attendance level and the results have shown that this Fair will be a significant industrial branh that will have its place in the Adriatic Fair programs in the years to come. The emission of the privileged Invest Bank Montenegro shares, worth EUR 5,000,026.73 has been sold out today in only 20 minutes. The offer started at 09:00 with the stock exchange opening and all 97,792 shares were sold by 09:20. All Montenegrin brokerage houses have participated, as well as other big market players on the stock market in Montenegro. A large numer of shares were bought by investors from Croatia. The majority transactions were closed through CG Broker. The nominal share value was EUR 51.1292 and it went up to EUR 99.90 per share.